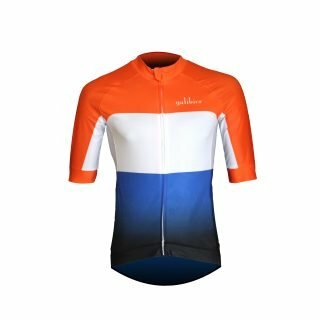 A leisure, summer cycling jersey. Sportief jersey is a light, garment constructed from Italian Airmesh fabric with the 1/4 length sleeves. The cut has aero arms with a little extra material on the torso for a comfort fit. A full YKK zip, gives additional adaptability as the sun rises and the low profile collar adds to the hot weather focused design. The jersey features a deep, angled and reinforced pocket structure, with an extra security pocket and a large 3M reflective strip to keep you visible in low light. The jersey uses a dual fabric silicon waist gripper allows the jersey to be loaded up without it losing shape on the bike.